Two requests for recipes that I get are for easy meal prep & recipes that involve beans. So, I decided today to combine both! I have been on a taco kick lately. I am not sure why, but literally all I want are tacos and taco bowls. 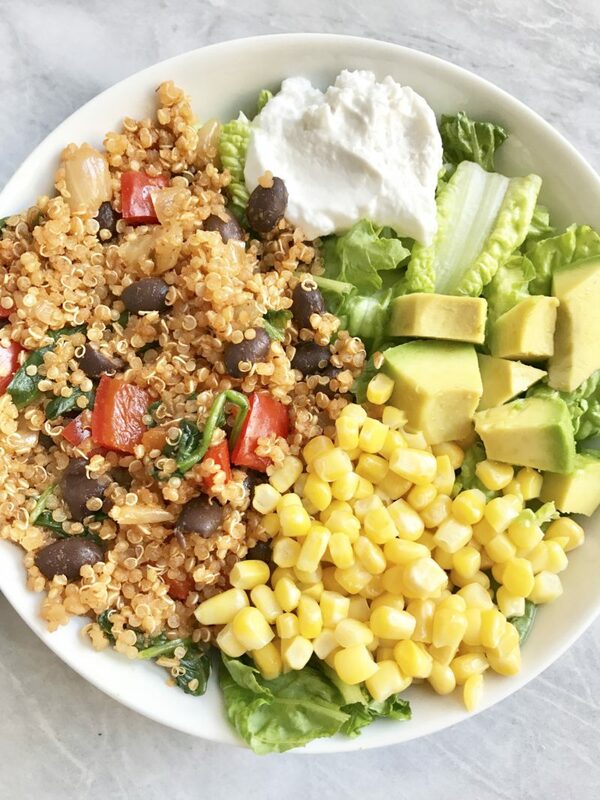 I wanted to make this meal a bit healthier, so decided to swap out rice for some quinoa. 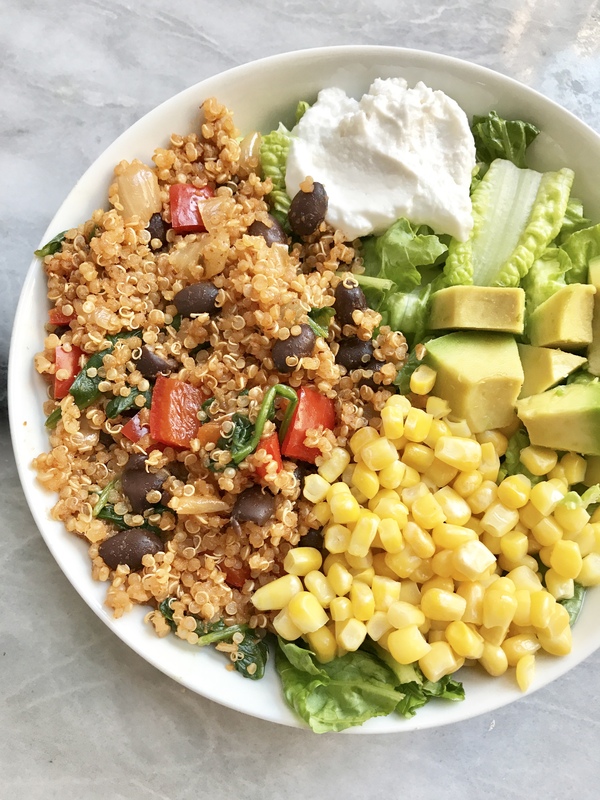 Quinoa is high in protein and is a great option if you want to cut down on rice consumption. Not that there’s anything wrong with rice, but sometimes its great to try something new! I really like the I Heart Keenwah Toasted Quinoa because it’s already toasted and adds a lot of great flavor. They also have a lot of other great quinoa based products. I wanted to also make sure this recipe had some veggies, so I managed to incorporate some spinach. There is also onion and pepper in this recipe, however it’s always nice to get that extra intake of greens! I love how versatile this recipe is! It’s great in tacos, burritos, and my personal favorite choice: salad. I love me a good taco salad! 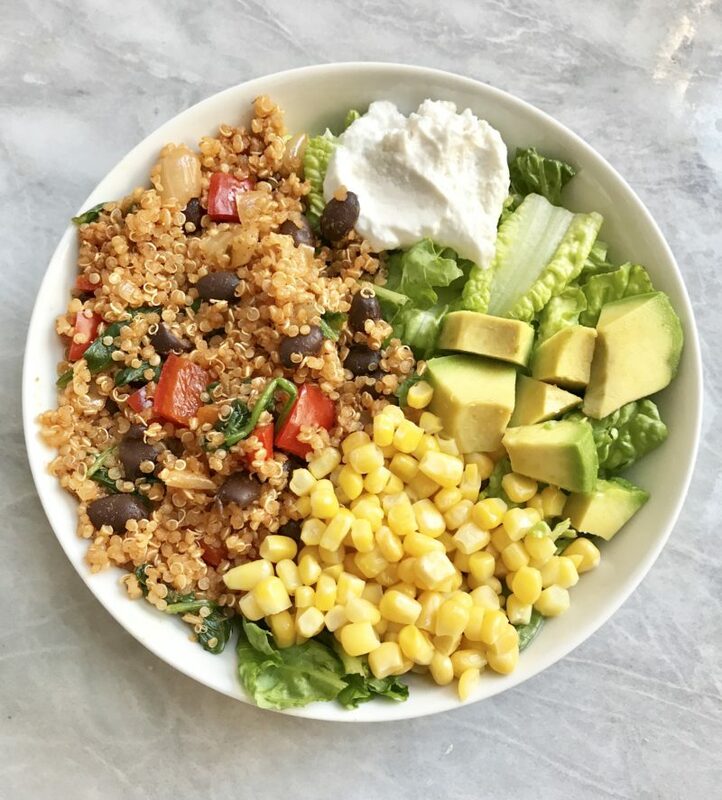 Pictured above is my favorite way to do it: Romaine, corn, avocado, vegan sour cream & some lime juice! I hope that you enjoy this recipe! If you ever make any of my recipes, tag me on Instagram @plantbasedjane so I can see! Begin by prepping your veggies. Chop up your onion and bell pepper. Also, mince your garlic. If need be, rinse your quinoa. In a medium sauce pan, heat up a little water. Add in your onions and garlic and cook 3-4 minutes. Add in all of your spices, and cook for 1-2 minutes. After, put in your tomato sauce and tomato paste. Cook for an additional 1-2 minutes. Add your quinoa directly to the sauce pan as well as the water. Let come to boil and then simmer and cover for 20 minutes, or until all the water is absorbed. In the mean time, heat up a sauté pan with a little water and cook your bell pepper. After 5 minutes of your bell pepper cooking, add in your spinach. Cook until spinach wilts and set aside. Also, drain and rise your black beans. 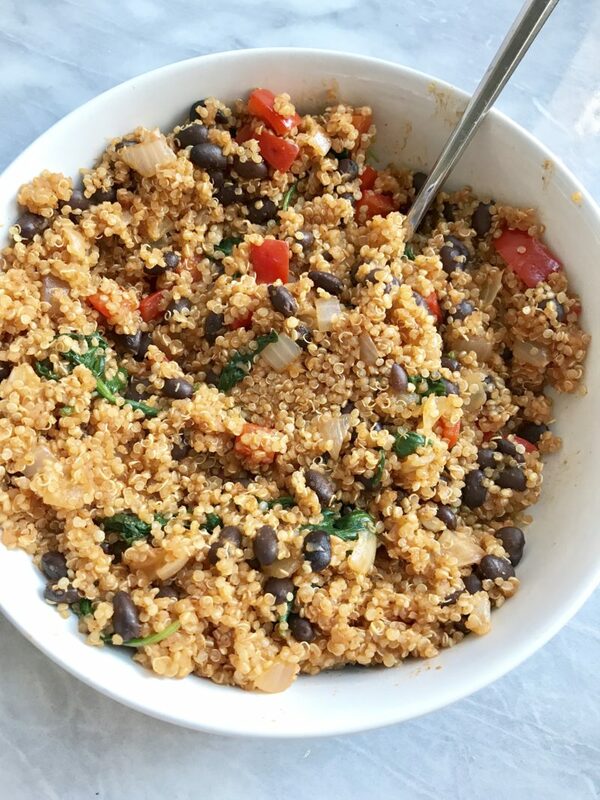 When the quinoa is done cooking, add your black beans, spinach & bell pepper straight to the pot and mix to combine.